Interview with Archimandrite Job (Getcha), Doctor of Theology, clergyman of the Ecumenical Patriarchate, on the significance of the primacy of Constantinople, world inter-Orthodox relations, and the issue of Ukraine. Archimandrite Job (Getcha) is a member of the Kyivan Religious-Philosophical Society, Society of Eastern Liturgy, Central Committee of the World Council of Churches and the Orthodox-Catholic Work Team of St. Irenaeus, a professor at the Catholic and Orthodox institutions. A year ago he was the only Ukrainian member of the delegation of the Ecumenical Patriarchate during the visit of Patriarch Bartholomew to Ukraine. The Archimandrite is well acquainted with the relations between the world Orthodox centers, is familiar with the state of affairs of Ukrainian Orthodoxy, and supports it from the depth of his heart. Therefore, RISU editors approached him with a few urgent questions. What, in your opinion, is behind this? And can the MP settle such issues on the internal level or should a joint decision of all the Orthodox be made on the global level? The issue of primacy in the Orthodox Church is not a new issue. It was settled long ago by canonical tradition. As early as 381, the Second Ecumenical Council decreed in its second canon that the primacy among the five ancient patriarchates belongs to the Roman See and that Constantinople holds the second place. Later, Canons 9, 17, and 28 of the Fourth Ecumenical Council in 451 granted the Constantinople Patriarchate special privileges, especially the practice of the right of appeal, about which the famous Russian Church historian A. Kartashov wrote an important article in 1936 (A.V. Kartashov, "The Practice of the Right of Appeal of the Constantinople Patriarchs", Warsaw, 1936). Certainly, after the divide of the Western and Eastern Church, when the communication between the Roman See and other Eastern patriarchates was broken, Constantinople took the first place in the diptychs of the Orthodox Church according to the canonical tradition and there is no doubt about this. To deny the primacy of the Ecumenical Patriarchate actually means to deny the canonical decrees of the Ecumenical Councils and Holy Scripture. If anyone denies that these decrees became “obsolete” and do not satisfy the “present circumstances” any more, one has to stress that no synod of an individual autocephalous Church is authorized to change them, and only an Ecumenical Council might review them if need be. One should also specify how this primacy is viewed in the Orthodox Church. Some accuse the Constantinople Patriarchate of eastern papism. Therefore, it is necessary to see how this supremacy is exercised within the Ecumenical Patriarchate. It is exercised in the spirit of Apostolic Canon 34, which envisages that bishops of each region should know who is first among them, recognize him as their head, and should not do anything special without his consent nor should the head do anything without the consent of the bishops. What does it mean? It means that the Ecumenical Patriarch is first of all the acting bishop of the Constantinople Eparchy. As the Patriarch he heads the Holy Synod of the Constantinople Patriarchate. His place is the head in the Synod and not over the Synod. The patriarch cannot dictate any decree without the consent of other members of the Synod. Like other bishops, he cannot interfere in the matters of other eparchies and cannot even serve a service there without an invitation from the local bishop. Can you imagine: today, the Chalcedon Eparchy is a part of what is now Istanbul. Every time the Ecumenical Patriarch wants to serve a service there, he, as the acting bishop of the Constantinople Eparchy, asks for a blessing from the Chalcedon Metropolitan and can serve in the churches of the Chalcedon Eparchy only with his blessing! The same applies to any other eparchy of the Ecumenical Patriarchate. What has it to do with papism? In the interview, Archbishop Hilarion ranks the Moscow Patriarchate among the ancient patriarchates even though the Moscow Church was established in the middle of the 15th century as the result of a schism with the Kievan Mother-Church and its patriarchate was recognized only in 1589-1593. Can it be considered ancient like the churches of Alexandria, Antioch, Jerusalem, and Constantinople? And what is your general evaluation of the interview? According to the diptychs of the Ecumenical Patriarchate, one should distinguish the “ancient” patriarchates (Constantinople, Alexandria, Antioch, and Jerusalem) from the “new” patriarchates (Moscow, Serbian, Romanian, Bulgarian, and Georgian). Why? The reason is not political! 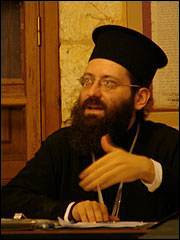 The reason is that the statuses of the “ancient” patriarchates were defined by the Ecumenical Councils in the first millennium and, therefore, we believe that they obligate not only the Orthodox Church but also the Western Church since in the first millennium it was in full communication with the Eastern Church and participated in the decisions of the Ecumenical Councils. The “new” patriarchates, on the other hand, arose during the second millennium and their statuses were recognized only on the Pan-Orthodox level by the initiative of the Ecumenical Patriarchate but were never approved by an Ecumenical Council. As for the interview of Bishop Hilarion, whom I respect as a friend and theologian, I can only say that, unfortunately, it shows more political subjectivity of a church official than scholarly objectivity of a theologian. For instance, the argument that autocephaly in Ukraine is impossible because Ukraine, Russia, and Belarus constitute one indivisible spiritual space is powerless if we take into account the history and modern system of the Orthodox Church. For instance, the present Greek state is divided between two church centers. Central Greece belongs to the Greek Autocephalous Church, whereas the northern territories, Athos, Dodecanese, and Crete fall within the Ecumenical Patriarchate. In addition, if one is to use the argument of the reverend bishop, then the autocephalies of the Polish Orthodox Church, and, perhaps, even, the Orthodox Church of the Slovakian and Czech lands as former parts of the Russian Orthodox Church would be impossible! After the visit of Patriarch Kirill to Constantinople and the meeting with Patriarch Bartholomew in Moscow, they began to talk about a change of relations between the two Orthodox centers. Experts evaluated these negotiations as an attempt of Moscow to prevent intensification in Constantinople’s participation in Ukrainian church matters. Is it really so and what is the Ecumenical Patriarchate’s evaluation of this meeting and did the attitude to the Ukrainian issue change in the Phanar? In my opinion, the main success of the visit of the Ecumenical Patriarch to Ukraine last year was the resumption of the preparation of the Pan-Orthodox Council and the inclusion of the Ukrainian issue in its agenda. In fact, after a decade of tense relations, Patriarch Bartholomew and the late Patriarch Alexis reached an agreement on this and Patriarch Alexis himself took part in the meeting of the heads of the Orthodox Churches at the Phanar in October of last year. It was also attended by Metropolitan Volodymyr (Sabodan), who officially addressed all the heads in writing with a request to jointly settle the Ukrainian issue on the all-Orthodox level. After this meeting, the preparation of the all-Orthodox council became more active. One meeting was already held in Chambesi last June. During Patriarch Kirill’s first visit to the Ecumenical Patriarchate after he was elected Patriarch of Moscow, Patriarchs Bartholomew and Kirill had an opportunity to discuss what had been done and had still to be done prior to convening the Pan-Orthodox Council. Certainly, in view of this preparation process, the Ukrainian issue will not be settled soon but it is by no means forgotten. On the contrary! A lot has been achieved in the last year. The hierarchical council of the Ukrainian Autocephalous Orthodox Church (UAOC) recently addressed Patriarch Bartholomew with a letter requesting His Holiness to actively engage in measures to heal the schism in Ukraine. In particular, the letter says: “We call the Ecumenical Council to develop and implement a complete theological-ecclesial program to establish in Ukraine the catholicity of the Church conscience.” What is your evaluation of this statement and what can the reaction of the Ecumenical Patriarchate be? The statement of the UAOC calling the Ecumenical Patriarchate to promote the “establishment in Ukraine of the catholic church conscience” is an important step to settle the matter of division of the Orthodox Church. By this statement the UAOC actually rejected the principle of ethnophiletism which is the main cause of the division of the Orthodox Church in Ukraine and seeks communication with the fullness of the Orthodox Church. Certainly, it would be even better and more effective if all the church structures, which are currently in communication with the fullness of the Orthodox Church, would unite and pass such a statement. I am sure that the Ecumenical Patriarchate will welcome such a statement but the process of further settling the Ukrainian issue is connected with the process of the preparation of the Pan-Orthodox Council, as mentioned earlier. You are a member of various international ecumenical forums. Unfortunately, the Ukrainian side actually is not represented there as a subject of relations, in particular, no Ukrainian Orthodox church participates in them. What role, in your opinion, can Ukraine play in the world ecumenical process and what is required for that? Of course, the participants of the official ecumenical forums are appointed by their Churches. Therefore, Orthodox participants are sent from each local Church. Since the only Orthodox Church in Ukraine that is in communion with the fullness of the Orthodox Church is part of the Moscow Patriarchate and the Moscow Patriarchate is mostly represented in the ecumenical forums by workers of the Department of External Church Relations in Moscow, Ukrainian participants rarely attend such forums. But they attend non-official forums. For instance, I, together with Archimandrite Kirill (Hovorun), am a member of a non-official group of the dialogue between the Orthodox and Roman Catholics of St. Irenaeus. The participation of Ukrainians in the ecumenical dialogue is very important, especially, with respect to the dialogue of the Orthodox with Roman Catholics, as they are directly connected with the question of “Uniatism.” In order for the Orthodox Ukrainians to be able to take a more active part in the ecumenical forums, the unity of the Orthodox Church in Ukraine is necessary. And the present process of preparation of the all-Orthodox council is very important for that.